. . Artist Statement . .
and its unpredictable serendipitous nature continue to captivate and challenge me artistically. I am inspired by the variety and raw beauty of the Maritime landscape and the people who reside here. Art and the act of its creation have provided me with numerous gifts and insights, which have enriched my life immeasurably. . . ﻿Biography . .
Gail Sutherland is originally from Montreal and moved to Nova Scotia in the spring of 1990 with her husband. She has a Fine Arts degree from John Abbott College and completed her BFA at Concordia University, with a specialization in graphic design. life drawing and studying with such artists as; Helmut Gerth, Judy Garfin, Alvaro Castagnet, and Brian Atyeo. When Gail moved to Nova Scotia, she was very inspired by the landscape that now surrounded her and began to paint professionally and exhibit locally. In 2011, Gail became an elected member of the Canadian Society of Painters in Water Colour and in 2018 she was delighted to be featured in the prestigious International magazine, “The Art of Watercolour”. The article highlighted her painting process, the landscape of Nova Scotia, and her winning painting (below), entitled “Tumble”, which won 3rd place national in the IWS Canada 150 online exhibition, “150 Ways to Celebrate”. Gail’s work has been exhibited locally and Internationally and can be found in many private and corporate collections worldwide. . . ﻿Representation﻿ . .
. . Education . .
. . Organizations & Affiliations . .
Won "Best Use of Light " ​at Parrsboro International Plein Air Festival. 150 online exhibition, "150 Ways to Celebrate" presented by The International Watercolour Society of Canada (IWS Canada). "The raw beauty of Nova Scotia’s varied landscape makes the province a mecca for artists. A near-island bathed in salty sea air and brushed by steady winds, the provincial landscape can be shadowed by dark clouds one moment and lit by a brilliant summer sun the next. From Land and Sea presents over seventy of the province’s contemporary landscape artists and their works. Each profiled artist appears with a short bio and artist’s statement, along with examples of his or her art. 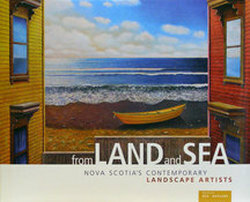 The artists covered in this book represent a wide range of styles prevalent in Nova Scotia landscape art today. With a foreword from Ray Cronin, director and CEO of the Art Gallery of Nova Scotia."